Can you believe it is the sunday before thanksgiving? Where has the fall gone? It has been a busy fall for us, with at least one show every weekend, and now we are in 2 pop up shops in addition to several galleries so there is need to restock and supply everyone with enough to get through the season. What is hot? Shaving soap for men, and salt/sugar scrubs. We can’t make either fast enough. (Such a problem to have, right?) So the elves at Images In Bloom have been mixing up the scrubs in large batches, and demoing when possible. It seems that when people try them they love them…. and they sell. Orange Clove Sugar Scrub has been the really hot seller… smells like those old traditional orange and clove ornaments we all made as kids. 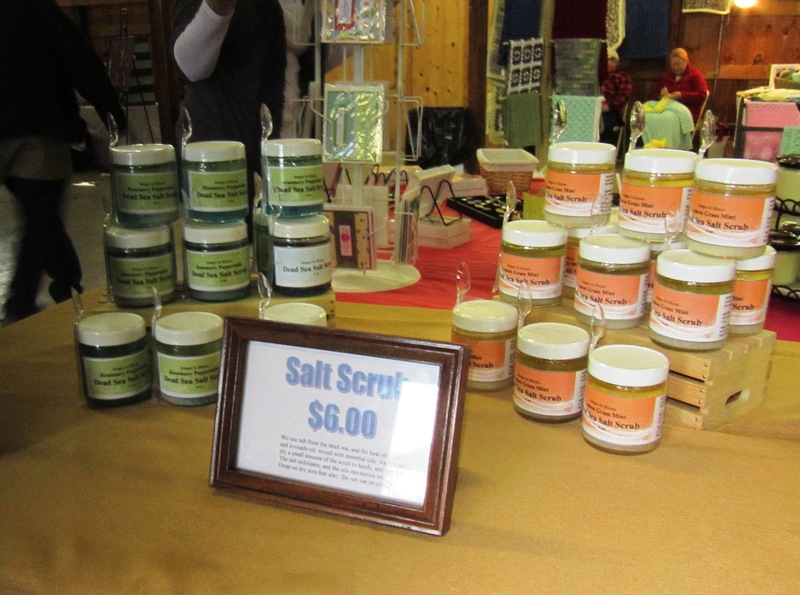 Lemongrass Mint Salt scrub has been the hot seller in salt. Pop Ups – As i mentioned, we are participating in two pop up shops in Cleveland. Pop up shops are short term retail establishments that pop up for a month and then end… they are collaboratives with multiple artists/vendors, and the retail operation is run by an individual or team. Cosmic Bobbins Pop Up is in the heart of downtown Tremont, and in fact is the storefront of the building owned by Tremont West Development Corp. A lovely small retail space, but well organized, and more high end on products, featuring the lovely cosmic bobbin bags made from upcycled magazines… very beautiful offerings, including the perfumes of Yates Apocathery, and our soaps, Reblooming Bags, salt scrubs and a few pieces of my silk. Sales have been epic there. We got an email the monday after her opening askign if we can come and restock. All of the mens products were gone – sold out. Wow. And my silk was selling. I love that so much. I just love the energy of this store. It is exciting to be part of it. So where are we today? Home most of the day. My poor home is in need of some love, and cleaning. Amazing when you get so busy that something has to suffer… and it has been the house. It will be nice to dust, vacuum and pick up the place so it does not look like an explosion of boxes, packaging and production. Perhaps one day we can have a studio space to work the business from which will minimize on the clutter. Winterfest – The energy is rising as we are within a week of Winterfest Cleveland, the big celebration on public square that leads to the lighting ceremony on the square. We were selected as one of the vendors to set up shop in the large tents on the square. And how nice, they listed us and provided a link to our etsy site. If you are in the Cleveland area next saturday venture on out and visit us. It is going to be a great day in Cleveland!!! I have not forgotten about you my friend, things have just been hard for me lately…I will get it together and then I’ll get that stuff together for you…Just lovely on the post by the way, you are such a busy lady! no worries… this is a very busy time for all… and i certainly understand. keep up with your writing. i have been reading your blog faithfully and found great encouragement from your writing.